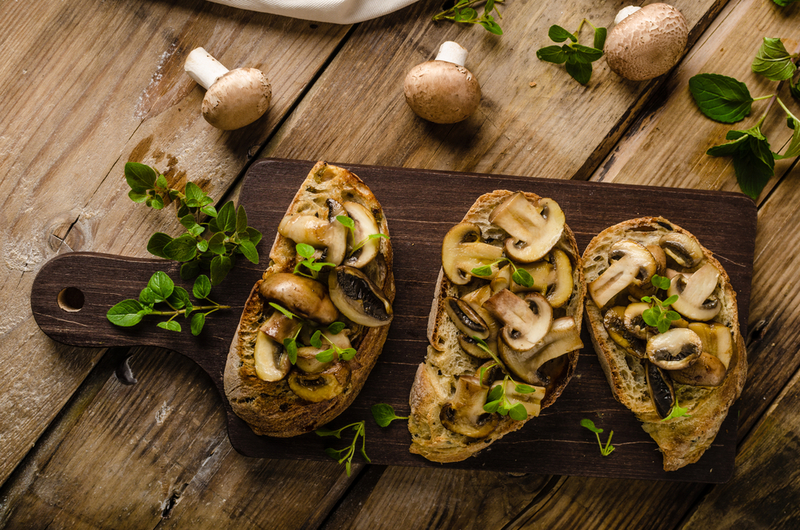 Heat a tablespoon of olive oil in a frying pan, then add all the mushrooms and garlic. Season and add the butter. Sauté for four minutes until soft then remove from the pan and drain. Keep the pan on the stove and add the red wine, stock and thyme and then simmer for 30 minutes. Next add the jelly and reduce by half, until it thickens. Remove the thyme and stir in the mushrooms. Cut the tops off the rolls and scoop out the filling, placing on a baking tray. Bake at 200C for seven minutes until crispy. Place the parsley and chestnuts in the mushroom mix. Finally fill the rolls with the mushroom mix and serve.